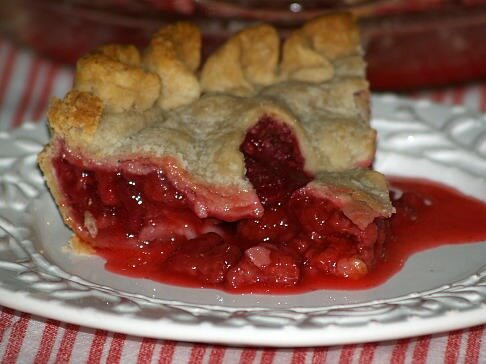 When I learned how to make a raspberry pie recipe it quickly became one of my favorite fruit pie recipes. I really like raspberries in many different kinds of dessert recipes. They really make an excellent choice when you are hungry for a fresh fruit pie. In the spring of the year you can find these berries growing wild in many areas along a fence line, along the road and almost anywhere. The cultivated raspberries were traditionally considered to be a summer berry but with technology today they are available most of the year in supermarkets. If you are learning how to make a raspberry pie recipe, one thing to consider when baking most fruit pie recipes is the amount of juice which comes from the berries when they cook. Use a good pie recipe which includes a thickening made from either flour or cornstarch. This will prevent the juice from overflowing the crust into the oven. I also always line the bottom self in the oven with foil or slide a tray under the pie to catch spillovers. 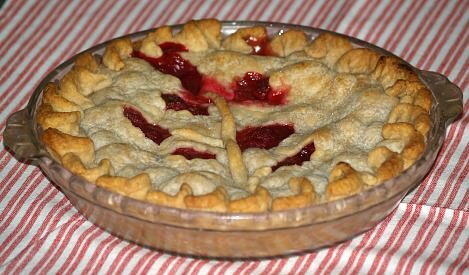 Some raspberry pie recipes will include a crust recipe with the pie recipe. Other recipes will list in the ingredients a baked or unbaked pie shell often specifying a commercially made crust. Many times you can switch the crust for something which you have available. For instance, you could make a homemade crust, either made with flour, cookies or graham crackers instead of buying one. Learn how to make a basic raspberry pie recipe. Preheat oven to 375F degrees; line bottom of pie plate. FOR FILLING combine sugar, cornstarch and salt in a large bowl; add raspberries and toss gently to mix. Spoon into unbaked pie shell; dot top with bits of butter. Moisten edge of pastry with water; cover top with pie crust. Cut top crust with knife slits or use small cutters to cut holes for steam to escape. Cover edge of crust with foil to prevent it from over browning; bake for 35 minutes. REMOVE FOIL and bake 15 minutes longer until bubbly and crust is golden brown. Cool to room temperature before cutting; serves 8. This is a favorite raspberry pie recipe. Mix together the crumbs and 5 tablespoons melted butter.Press into a 10 inch pie plate. Cream together the ½ pound butter, sugar and eggs until light and fluffy. Thaw and drain the berries, reserving the liquid. Thicken the liquid with the cornstarch over low heat until it comes to a boil. Cool and add the drained berries back into the thickened juice. Pour the creamed butter/sugar filling into the pie shell. Arrange the sliced bananas on the top of the filling. Pour the raspberry mixture over the bananas. Top with whipped cream or Cool Whip. Serve cold. Brush crust with the egg white. Bake at 400F degrees for 5 minutes. Let set until cold. Combine the sugar, salt, cornstarch and flour in a medium saucepan. Gradually add the water while stirring. Cook over medium heat for 3 minutes, stirring constantly. Remove from the heat and gradually stir about ¼ of the hot mixture into the yolks; add back into the hot mixture in the pan, stirring constantly. Cook 2 additional minutes over medium heat. Remove from heat and add butter, lemon juice and grated lemon rind,. Stir well. Pour into prepared crust. Chill for a couple hours. Top with the raspberries before serving. This is an easy raspberry pie recipe. Drain raspberries reserving syrup; add water to syrup from berries to make 2/3 cup. Dissolve gelatin in boiling water; add lemon juice and raspberry syrup mixture and blend well. Chill until partially set; beat gelatin mixture until soft peaks form. Fold in raspberries and whipped cream reserving some for topping. Add salt to egg whites; beat until stiff peaks form. Add sugar gradually and beat into stiff peaks; fold into raspberry mixture. Pile into cooled pie shell; chill. Top with whipped cream and fresh raspberries. Combine and mix 2 cups flour and salt; add shortening and cut in until crumbly. Add water and stir into a soft dough; shape with hands into ball; do not overwork. Cover dough and let rest for 5 minutes. Prepare filling by combining berries, 1 ¾ cup sugar, lemon peel and 6 tablespoons flour. Roll out half of pie dough and line 10 inch pie pan; roll out remaining dough and cut into long strips. Place filling in pie pan on top of dough; using strips of dough quickly make a lattice top over the filling. Trim dough and crimp around edges of pie; sprinkle top with 2 tablespoons sugar. Cut butter into tiny pieces and place in holes in lattice of pie. Place in preheated oven at 350F degrees. Bake about 50 minutes until center is bubbling and crust is browned. Learn how to make this delicious raspberry pie recipe with ice cream. Line pie plate with rolled pie dough; trim excess dough and crimp edges. Sprinkle over crust 1 teaspoon sugar and almonds; bake 10 to 12 minutes until slightly browned. Fold raspberries into sherbet in a large bowl; fold in vanilla ice cream making a swirl effect. Spoon ice cream mixture into cold crust; freeze until firm or overnight. FOR SAUCE combine sugar and cornstarch in a saucepan. Stir in reserved raspberry juice about 1/3 cup; cook and stir over medium heat until mixture is thickened. Stir orange juice into hot mixture; cool completely. Before serving remove pie from freezer (About 20 minutes) and stand at room temperature. Cut into wedges and serve with sauce; serves 8. I am including here a basic one and two crust recipe for your convenience when making a raspberry pie recipe. You can find other crust recipes throughout this Painless Cooking web site. Reserve 1/3 cup of the flour; sift remaining flour and salt together in a bowl. Cut shortening into the flour and salt mixture until crumbly. Blend the 1/3 cup of flour with the water to make a paste. Mix paste thoroughly with the crumbly mixture until dough ball forms; divide dough into 2 balls. Roll 1 ball between 2 pieces of wax paper to 12 inches round and 1/8 inch thickness. Remove 1 sheet of wax paper; turn rolled dough over lightly into pie plate fitting it into the plate. After filling the pie shell roll part 2 of dough the same way. Cover pie and trim excess dough ½ inch beyond edge of plate; crimp edges. FOLLOW ABOVE DIRECTIONS RESERVING ¼ CUP OF FLOUR. If baked shell is needed, prick holes in bottom with fork and bake 8-10 minutes at 375F degrees.